The ocean's ability to store large quantities of carbon, combined with the millennial longevity over which this reservoir is overturned, has implicated the ocean as a key driver of glacial–interglacial climates. However, the combination of processes that cause an accumulation of carbon within the ocean during glacial periods is still under debate. 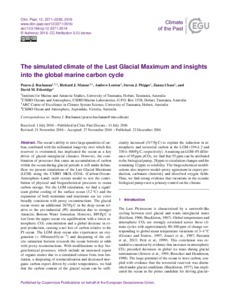 Here we present simulations of the Last Glacial Maximum (LGM) using the CSIRO Mk3L-COAL (Carbon–Ocean–Atmosphere–Land) earth system model to test the contribution of physical and biogeochemical processes to ocean carbon storage. For the LGM simulation, we find a significant global cooling of the surface ocean (3.2 °C) and the expansion of both minimum and maximum sea ice cover broadly consistent with proxy reconstructions. The glacial ocean stores an additional 267 Pg C in the deep ocean relative to the pre-industrial (PI) simulation due to stronger Antarctic Bottom Water formation. However, 889 Pg C is lost from the upper ocean via equilibration with a lower atmospheric CO2 concentration and a global decrease in export production, causing a net loss of carbon relative to the PI ocean. The LGM deep ocean also experiences an oxygenation ( >  100 mmol O2 m−3) and deepening of the calcite saturation horizon (exceeds the ocean bottom) at odds with proxy reconstructions. With modifications to key biogeochemical processes, which include an increased export of organic matter due to a simulated release from iron limitation, a deepening of remineralisation and decreased inorganic carbon export driven by cooler temperatures, we find that the carbon content of the glacial ocean can be sufficiently increased (317 Pg C) to explain the reduction in atmospheric and terrestrial carbon at the LGM (194 ± 2 and 330 ± 400 Pg C, respectively). Assuming an LGM–PI difference of 95 ppm pCO2, we find that 55 ppm can be attributed to the biological pump, 28 ppm to circulation changes and the remaining 12 ppm to solubility. The biogeochemical modifications also improve model–proxy agreement in export production, carbonate chemistry and dissolved oxygen fields. Thus, we find strong evidence that variations in the oceanic biological pump exert a primary control on the climate.